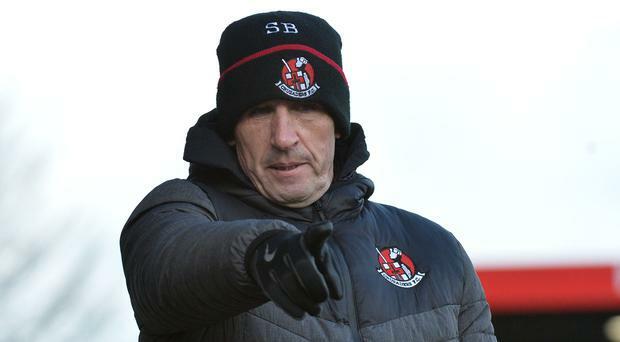 Crusaders manager Stephen Baxter has no regrets about resting several key players for Saturday's draw with Ards. With one eye on next weekend's Tennent's Irish Cup semi-final with Coleraine, the Crues boss explained: "We have a number of knocks and we have a few players that are one yellow card shy of a suspension, so it made sense to protect those players. "For example, if Billy Joe Burns picked up a yellow against Ards he would have missed the Coleraine match, which is obviously huge for the club. "I've no regrets about making those decisions because we had enough quality on the pitch to win that game and we really should have won it when you look at the chances we missed." Crusaders found themselves 2-0 down thanks to goals from Mark Kelly and Craig McClean, but strikes from Declan Caddell and Ronan Hale rescued a draw. Ards chief Warren Feeney said: "If you had offered me a point against the champions before kick-off, I'd have been over the moon with that. However, the boys are gutted in there. I think that says a lot. They're disappointed with a draw against the champions. They have the right mentality. "You can't fault their effort. Even against Warrenpoint last week, there was no shortage of effort. They're desperate to stay in this league." Crusaders: O'Neill, Ward, Caddell, K Owens, McChrystal (Ruddy, 34 mins), Forsythe, Snoddy (Cushley, 59 mins), McGinley, Ronan Hale, Rory Hale, J Owens. Unused subs: Doherty, Beverland, Coates, Lowry, Thompson.